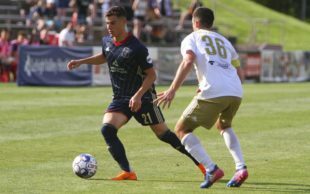 In addition to adjusting their tactical approach and making the roster younger, Ernst Tanner is making a third major change to the the 2019 version of Bethlehem Steel FC. Bethlehem will fly to Clearwater on January 28, play two closed scrimmages in Clearwater while there, and fly home Thursday, February 7. They have never before held a portion of preseason camp in Florida. The Steel’s travel days correspond exactly to the travel days for the first team. One scrimmage is on Saturday, February 2 at 4 PM against D.C. United. The other is against Chargers Soccer Club who play at four locations in Tampa and its environs. Several Chargers SC alumni have gone on to play for the Union organization, notably Zac McMath and, possible future Steel signing Nathan Harriel. Jim Curtin has said in past years that the very first week allows players to play in familiar positions to show themselves at their best and that alterations would be implemented later on. The January “in-market” week at Penn Park seems to serve that purpose. Here are some logical inferences. Working together in Florida means the organization’s entire technical staff can see and evaluate the entire professional group together with select Academy players. Direct observation beats long-distance phone calls. Bethlehem will not use trialists for practice while cornerstone players are working with the first-team elsewhere. Matt Mahoney was the only trialist to survive more than a season; none even made the squad last year. Both teams will learn Tanner’s new systems together at the same time. All players will hear the same things and having opportunities to ask questions and hear answers, which will maximize efficiency and understanding. Bethlehem’s scrimmage against D.C. United will likely pit first-team reserves and serious candidates for Loudon against first-team reserves and serious candidates for Bethlehem. The Chargers SC scrimmage will likely feature younger players, in keeping with Curtin’s past practice that if you go to Florida you get a game opportunity. Or maybe because they don’t have enough first team bodies to scrimmage??? More amateur hour crap from Jay Sugarman and his minions. I don’t get how you can see this as a negative. It’s a great opportunity for the young players on Steel. Also to be fair, it costs the organization more money to transport and house twice the number of players and they are willing to do it. It’s great they are going. Would be better if we had 30 bodies including the key players for 2019 under contract. This is Donald Trump distracting us from his treason and corruption and destruction of the country by feeding Big Macs to the Clemson football team. Let’s see a useful signing. Please!!!!!! Actually this is completely opposite of amateur hour. This is how it should be done and if not ahead, certainly along with the curve. If the majority of what Surgarman spends goes towards development, you might as well find out what you have. Where do the pieces fit. What pieces don’t fit. Who may or may not have a future so you can plan accordingly. There’s the saying “make your money work for you”. This is making your investment in the academy/Steel work for you. And a veteran goalkeeper backup so Freese can take games with Bethlehem.